Main research interests: working and volunteering in later life and the impact of the fuller working lives agenda on employment, training and career development; skills development and career progression of apprentices and graduates; health and social care labour markets and policy related developments; and migration. Beate Baldauf is a Senior Research Fellow at the Warwick Institute for Employment Research, University of Warwick. With a background in social sciences, she has been working in research for more than 30 years and is experienced in both qualitative and quantitative research methods. Since joining the Institute in 2000 her research has focused on working in later life, higher and vocational education and training (including research on apprenticeships and graduates); and sector studies on aspects of the health and social care labour market. 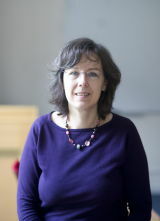 Prior to IER she worked at other research institutes in the UK and Germany, notably the Centre for Educational Development, Appraisal and Research (CEDAR) at the University of Warwick, where she took up a two-year EC funded Human Capital and Mobility research fellowship, and the (now) International Centre for Higher Education Research (INCHER) at the University of Kassel, Germany. Key research areas included doctoral education and research training and graduate labour markets in Germany.